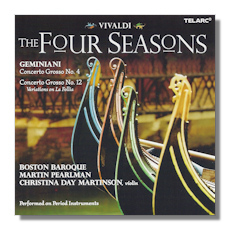 Concerto Grosso after Corelli #12 in D minor, Variations on "La Follia"
You may argue that the market is already more than saturated with myriad versions of Vivaldi's "Four Seasons" but this fine new recording by the eclectic Boston Baroque really deserve some exposure for its undoubted merits. Martinson is a violinist of refined technical stature and she plays the concertos with unashamed virtuosity and true excellence. The "Spring" Largo and Autumn's Allegro alla caccia are typical cases in point where she lets the music flow with some superb backup from the Boston players. I wouldn't go as far to state that this is the version to have in your collection (Nigel Kennedy and Anne Sophie Mutter are still top for me) but this is surely amongst the top 10 currently available. The couplings are also of extremely high quality with two fine works by Geminiani especially the lovely "La Folia" variations which remain one of my favourite works. Recordings are absolutely top notch in every department and the period instruments sound strikingly natural. This is a true gem of a disc that begs to be listened to again and again.